Learning how to refer to your grandparents in French is an important vocabulary lesson for beginning French speakers. When describing yourself and your family, most French people would describe not only immediate family, but also their extended family. Use the French terms for 'grandma' and 'grandpa', or you can refer to them with affectionate French equivalents for terms like 'grammy' or 'nana'. The most common translations in dictionaries for grandparents are the literal translations of 'grandmother' and 'grandfather'. In French, these terms are, respectively: grand-mère and grand-père, or grand-maman and grand-papa. These terms are also commonly used in speech and writing. One of the most common mistakes for non-native French speakers to make when using these terms is forgetting to make the term agree with the rest of the phrase. For example, the article must be appropriate in gender, so you would say, ma grand-mère, but mon grand-père. This distinction in gender is especially difficult for native speakers of English to learn because in English, the pronoun 'my' is invariable. Adjectives also must agree with the terms grandmother and grandfather. For example, if you want to say that one is blonde and one is brunette, then you would have to make the terms agree: ma grand-mère est blonde (with an 'e' at the end, signifying the feminine gender), mais mon grand-père est brun (without an 'e,' signifying the masculine gender). What Are Some Different Names for Grandmother? While you can simply say 'mes grands-parents' to refer to your grandparents, it's also common to have names that you call grandparents when addressing them directly. 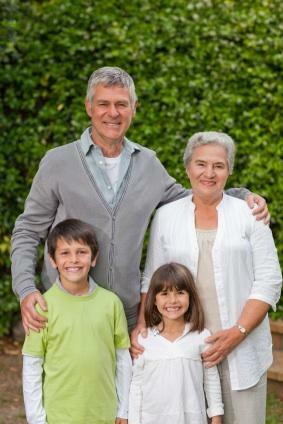 Grands-parents, grand-mère and grand-père are good terms for referring to the people when you are talking to somebody else, but French families also have names for grandparents, just like English-speaking families do. The variety of French names for grandparents is smaller than in English because many of the English names are influenced by family roots in other languages, such as Spanish, Italian, French, and German. The most-commonly used variant across France and other French-speaking regions is mémère and pépère. These two names require extra explanation in the realm of pronunciation, as they are often pronounced very differently than they are written. In most regions, these terms are pronounced with the second syllable shortened to 'ay' (French spelling: é, er or ez) instead of pronouncing the syllable as it is spelled, which would sound like a French pronunciation of the English word 'air'. These forms can also be written out and used: mémé and pépé. Another very common set of terms is papy (or papi) and mamy (or mamie). These terms are primarily used in France, whereas mémère and pépère and mémé and pépé are used in both France and Canada. Learning how to say "grandma and grandpa" in French so that you can refer to them when describing yourself and your family is fairly easy to do, as is learning the terms that French-speaking people use when addressing their grandparents directly. You will hear these affectionate names in movies and television shows, or when you see French speakers interacting with their grandparents or talking with them on the phone. Learning both types of terms is a good addition to your French vocabulary. Beginners can learn these words with ease, and by the time proficiency reaches the intermediate level, the names should also be easily pronounced by non-native speakers even though a slight accent usually remains.